With Beijing as my first mainland China destination, I didn’t have a clue what to expect upon landing. Authentic Chinese food? Sure. Hot summer nights? An understatement. Language barriers? Definitely. Internet problems? I didn’t think so. Great hotels? A given. Not yet having celebrated its one year anniversary, Rosewood Beijing is enjoying the honeymoon phase. As the brand’s first property in China, the 22-story Rosewood Beijing recently debuted in the city’s Chaoyang District across from the iconic CCTV Tower. It’s brand new, striking, tech-savvy, grand yet comfortable and full of promise – just like a newly-married, modern couple. As if the bedroom and terrace didn’t suffice, I scoped out the bathroom for obvious reasons: I love a good tub. Well hold the phone and call me Jay Z. I was sipping from the cup til it runneth over. I had found the Holy Grail. Complete with count ’em TWO water-bed massage tables, a steam shower/sauna and soaking tub for two, I contemplated skipping the Great Wall for this water world. Okay, not really, but a girl needed ample time to really get some “research” done in here. I needed to test out the water beds, simply for reasons which included not having seen one in, I don’t know, decades. The bath salts were screaming to be utilized, and the sauna was ready to get on the same playing field as a Beijing summer. Needless to say, the 6th floor was beyond suite. Everyone wants a good home-away-from home when they travel. The Spa Suite was elegant yet homey, but going the extra mile to transport guests into a warm and friendly state-of-mind was the Manor Club. This executive lounge with its sophisticated, residential style offers a tranquil atmosphere for guests seeking a private urban refuge. Guests like me who have a large to quite large sweet tooth will love the space for many reasons, the most important being 1) to raid the macarons and 2) to get some work done. The Manor Club is more than just an office-meets-bakery. More than once the personable staff helped me and my 99 problems which included but weren’t limited to: print-outs, train tickets and breakfast on-the-go. During my early morning trip to the Great Wall, I was running behind due to a wardrobe malfunction. Upon getting to the Manor Club for my complimentary breakfast, I suddenly realized that once completing the Mutianyu section of the Great Wall, I’d be departing the vicinity via toboggan ride, and my dress wasn’t going to fly (actually, that’s exactly what it was going to do.) I retreated back downstairs, changed into pants, and my breakfast magically met me in the car for the trip to the Wall. The most important piece of information The Manor staff provided was that specific websites are blocked in China under the policy of internet censorship. This included the ever popular and necessary Google, Instagram, Facebook, Twitter, Youtube, Dropbox, SoundCloud, and Vimeo – basically everything fun. To combat this, I simply downloaded the VPN Express app that allowed me to bypass the restrictions. Happy surfing! For all of you wondering, yes, Chinese food in China is very different from Chinese food in the States. I had dinner with the nicest Chinese woman from the hotel who gave me a rundown of Beijing specialities which included the most intriguing dish: duck feet. Mmmmm. What’s most important about duck is its tender and chewy skin. It’s typically marinaded and shouldn’t be greasy or oily in taste. The dish is served with pancakes, skin, sweet paste and vegetables. Locals eat the whole duck in its entirety. More popular Chinese dishes are chicken feet, scorpion and king pow chicken. If I haven’t sold this outstanding piece of property yet, allow me to introduce you to even more indulgences. A visit to the indoor swimming pool, Jacuzzi, fitness facility, aerobics room and yoga studio can take up an entire day. Scratch that. An entire weekend. As much as I loved the next destination of Shanghai, I could’ve pushed my train reservation back all weekend to bask in the glory of Rosewood’s wellness center. A trip to Beijing isn’t complete without a visit to the Great Wall. 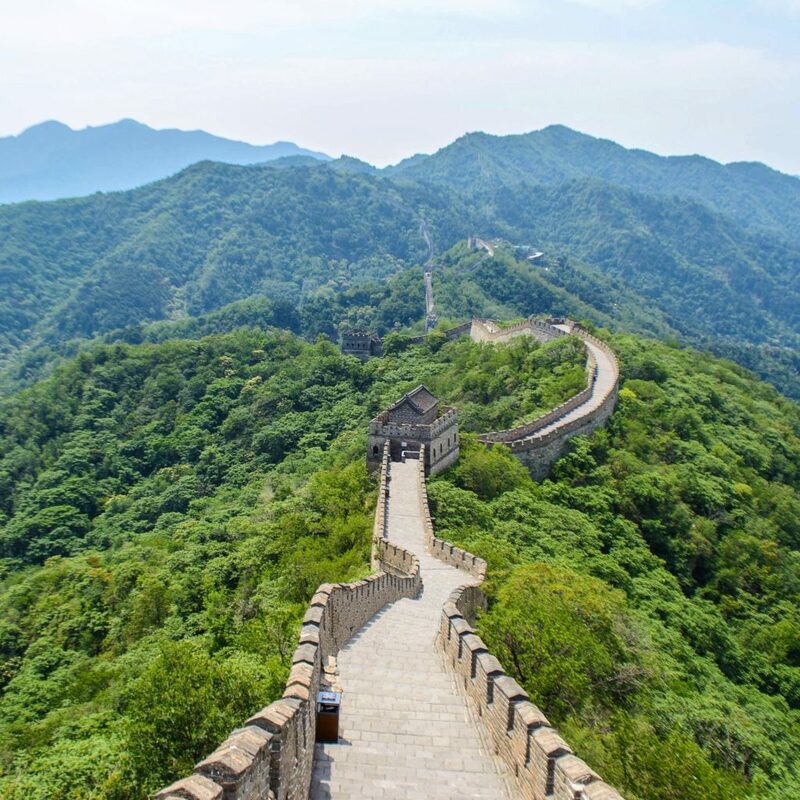 About an hour and a half from Beijing lies the popular Mutianyu section of the wall, winding along lofty mountains from the southeast to the northwest for a little over a mile in distance. To get there, I’d suggest hiring a car and driver and going early in the morning. I left at 7:30am to arrive at 9:20 to be exact and was walking alone for small spurts of the morning. The Great Wall is, in a word, great. It’s a massive landmark and defensive fortification dating back to over 2,000 years. It winds and snakes across 13,000 miles of western to eastern China. It went through constant extensions and repairs and began as independent walls for different states when it was first built. It wasn’t until the Qin Dynasty that it was termed the “Great” Wall. That being said, packing a lunch and bringing a good amount of water along with you is essential. Beijing summer heat is something serious, fitting inside the definition of uncomfortable, but singing the Mulan soundtrack at the top of my lungs had me forgetting that passerbys could see straight through my shirt. What I found comical was that many would stop me to take a photo together. I assure you, this wasn’t due to my sweaty shirt. It wasn’t because I was on The Bachelor. They liked my blonde hair and white skin, and I was happy to smile for the papa-paparazzi. In order to get to the actual wall, visitors need to buy two tickets: a shuttle ticket and a gondola ticket, used to take a shuttle bus to the gondola. Nobody said getting to one of the world’s most historically significant attractions was easy. I’d suggest a different route for getting back to ground level. Find the toboggan ride at the Mutianyu section and have one hell of a ride down. Note to riders: give ample time for the riders in front of your to gain distance. I had an older gentleman in front of me who wasn’t about to go 1 mph over 5. It was a party, let me tell you. Either way you go about it, few attractions are as unique as experiencing the Great Wall for the first time. Exhausted after two hours from heat and sensory overload, I spent the ride back to the Rosewood reliving the past two days. 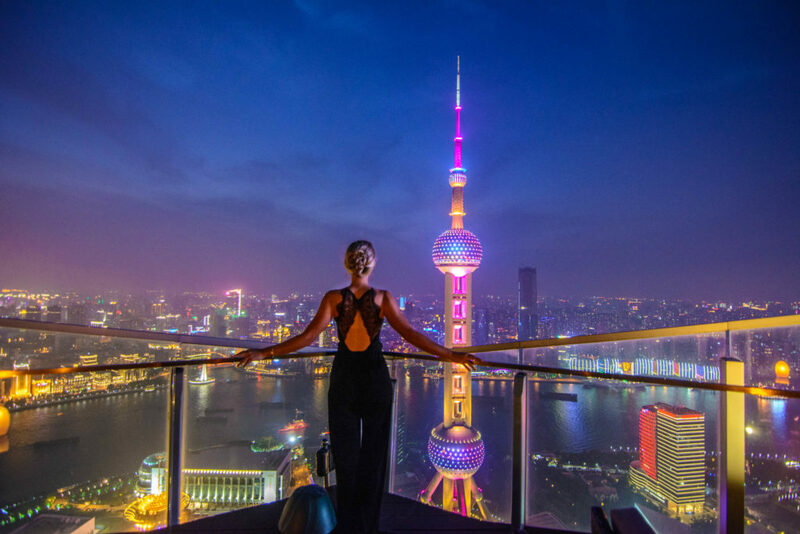 Shanghai had a lot to live up to! Love the rosewood and your insight on how to visit the Great Wall. My company recently decided on a hotel for a Beijing conference this year. Looking forward to staying here. Great article!